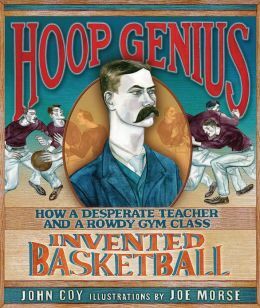 In 1891, James Naismith took over a gym class with trepidation. It was a rowdy class of young men, so rowdy that two teachers had already quit. But he was determined to make it work. The young men were bored of the same old exercises, Naismith realized, and they needed something fun. He tried established outdoor games but they were too rough for indoors. He needed something new. Remembering a game he played as a boy called Duck on a Rock, he thought about a game where points were earned by throwing a soccer ball into a box. Asking the building superintendent for boxes, all Naismith found were old peach baskets. He wrote up a list of rules, thinking that if this version did not work, he would go back to the exercises. He didn’t allow pushing or tripping, so the students had to work together rather than bully one another with brute strength. Once the class got used to the rules, they liked the challenge of the game. When the students went home for the holidays, they taught this new game to people in their hometowns. A group of women wanted to play the next semester and they played as vigorously as the men. In 1936, basketball had become so popular, it became an Olympic sport and Naismith was recognized at the games. One of the charms of this story is that an unruly class led to something as popular as the game of basketball. What student hasn’t been in a rowdy class? This will be a great option for those third grade biography reports done in costume or as a PowerPoint presentation. The illustrations are muted and evocative of turn-of-the-century art. A great class read aloud or a good selection for a third grader to read to a younger book buddy as a literacy activity. The original posted basketball rules are shown on the end pages and a bibliography is included. Activities are available at the publisher’s website with a log-on: https://www.lernerbooks.com/products/t/11692/9780761366171/hoop-genius.